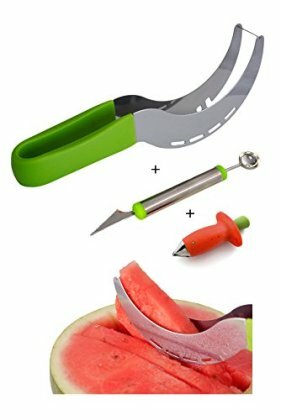 PREMIUM 304 STAINLESS STEEL Watermelon Slicer Cutter - Largest Yet Of 10-Inches Long - Is The Fastest Way To Cut Watermelon. NON-SLIP LARGE HANDLE On Watermelon Slicer Cutter Is Sturdy And Easy To Hold; Designed For Big Hand. IDEAL FOR MAKING STUFFED STRAWBERRIES Strawberry Huller Magic Stem Remover Removes Stems In Seconds. Easy To Use. Perfect Result Every Time. 10X Faster Than Traditional Method. LARGE STAINLESS STEEL Melon Baller 10-Inches Long With Serrated Fruit Carving Knife. 100% SATISFACTION GUARANTEE - Your Complete Satisfaction Is Our Ultimate Goal. Love It or Your Money Back.